Here is a list of common questions from users of My Family Tree. Where is my family tree information stored? Most users save their family tree directly onto their device, safe in the knowledge that all the information is then kept privately on their device. Some users choose to save their files to the cloud, which is very useful for backing up or sharing with other family members. For more information on My Family Tree files click here. My computer hard disk failed. Can you recover my file? Your family tree information is stored in a file on your computer. We do not have copies because the data is stored on your device: it is never sent to us. We recommend you keep regular backups in case of computer failure. Many users choose keep regular backups of their files on USB pen drives, external hard drives, CDs, or the cloud just in case. Does My Family Tree support this database format? Databases created by some applications can be directly imported into My Family Tree without the need for GEDCOM. This process is called direct import and helps ensure all data is migrated from your existing database. My Family Tree supports direct import of databases created by Personal Ancestral File (PAF), Ancestral Quest, Legacy, and several other applications. My Family Tree also has comprehensive GEDCOM import option with full support for all known versions of GEDCOM. Our support team are happy to help users who are struggling to convert their file. Why did images not transfer from my GEDCOM or database file? When you load a database from another application or import a GEDCOM file, images multimedia files are not actually contained in the database or GEDCOM file. Files can only be automatically imported if they can be found on the local disk. Any links to online files or files which cannot be located will be imported as place holders. You will be prompted to search for them after the import, or you can resolve them at any time in the Multimedia view. Transferring a GEDCOM file from one device to another does not transfer your multimedia files. To automatically import multimedia files, place a copy of the files in the same folder as the GEDCOM file or a subfolder next to it. The main chart can be printed using from the chart tool bar. My print outs are blank. Blank print outs are only caused by printer issues (and not issues with My Family Tree). • Check your ink levels. • Check ink nozzels are not blocked. • Ensure you're using up to date print drivers. 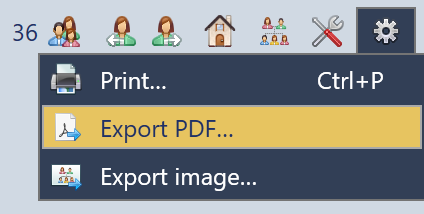 • Use the 'Microsoft Print to PDF' to make a pdf file and try printing that. How do I show all the people in the family chart? By default, up to 5 generations of ancestors and 5 generations of descendants are shown but you can change this in the chart options. To access the chart options, click the button at the top of the chart view. The family chart tree is purposely focused on the selected person so it shows just that person's direct blood ancestors (parents + their siblings, grandparents + their siblings, etc.) and blood descendants (children + their spouses, grand children + their spouses, etc.). You can optionally show adoptive/foster parents or adopted/foster children of the currently selected person. It is not possible to show children of aunts/uncles. However, in most cases, you can selecting a parent or grandparent will display the view you want. For more information on the family chart see here. There are several ways. The easiest way is to select them in the chart and use the "Delete current person" option. Do we support Mac/Linux/Android etc? As noted in the system requirements, My Family Tree is only compatible with Windows. If you want to transfer information entered in My Family Tree to software on Mac/Linux, use the GEDCOM export feature.